Micro-surgical DREZotomy (MDT) – tries to selectively interfere the small nociceptive and the large myotatic fibres (situated laterally, centrally and respectively), while sparing the large lemniscal fibres which are reordered medially. It also enhances the inhibitory mechanisms of Lissauer’s tract and dorsal horn. 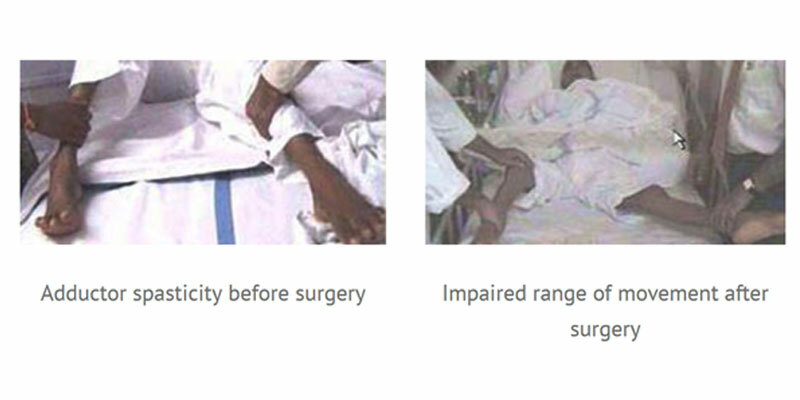 MDT is indicated in bedridden paraplegic patients as well as in hemiplegic patients with painful hyper spasticity. It can also be used to treat neurogenic bladder with uninhibited detrusor contractions. Microsurgical incisions are taken 2–3 mm deep in the dorso-lateral sulcus. It is done at an angle of 35 degrees for cervical level and at 45 degrees for lumbo-sacral level. It is tracked by bipolar congealing performed ventro-laterally at the entrance of the rootlets into the dorso-lateral sulcus, along all the cord segments. In addition to the study of the muscular responses, surface somatosensory evoked potentials. (SSEPs) recordings are useful for identification of the spinal cord segments. Recordings of surface SSEPs can also be helpful to monitor the surgical lesion itself as well as the dorsal column and dorsal horn potentials.